Truly a natural wonderland, Bear Creek Provincial Park is situated in the Central Okanagan Basin on the west side of Okanagan Lake. This park is extremely busy during the summer season and reservations are required to camp here. For your convenience, during the summer season the park has a concession located at the gatehouse and managed by the park operator. Campsite reservations are required for all campsites in this park. 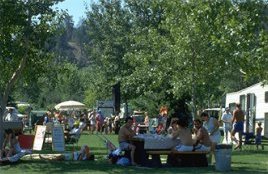 The park is located on Westside Road, 9 km off Highway 97, west of Kelowna. From Highway 97, travelling south, leavethe city of Kelowna, cross floating bridge on Highway 97 out of Kelowna, travel 2 km and turn west onto Westside Road at the main intersection and follow for 7 km. The entrance to the park is just past the bridge over the Lambly (Bear) Creek. The closest community, towns and cities are Kelowna, Westbank and small housing developments on Westside Road. Conservation: Ponderosa pine and Douglas-fir proliferate in the dry, rocky hills above the canyon, balsam-root and prickly-pear cactus compete for the area’s meager rainfall. The canyon floor below is home to maple and birch, saskatoon and buffalo berry, wild rose, horsetail and mosses. Flowers, trees and shrubs are part of the park’s natural heritage, please don’t damage or remove them. Wildlife: Wildlife abounds from the swallows and hawks that swoop through the canyon to the owls and coyotes that enliven the night. Noisy tree-frogs can be heard in the spring, crickets are active in the summer. Park users should always be aware of bears and other wildlife in our park environment. Never feed or approach bears or other wildlife. Canoes and kayaks are welcome. A private company on-site offers people-powered water toy rentals. Cycling on roadways in the park; helmets required. No mountain biking trails. Various freshwater fish available in Okanagan Lake. Anyone fishing or angling in British Columbia must have an appropriate licence. For information about freshwater fishing, including regulations, restrictions and limits, please check the: BC Freshwater Fishing Regulations Synopsis. Gentle trails take hikers around the campsites and along the creek as it passes through the campground. The Bear Creek Canyon trail is a popular, more demanding hike offering spectacular views of the creek and the surrounding area. The trail leaves the parking lot and makes a loop of the canyon. Hikers can cross the creek on a footbridge to the north side of the canyon and begin their ascent of the slope. A sturdy staircase of milled lumber makes the climb a little easier and reduces impact on the plant life and soil structure. A viewpoint after the first flight of stairs offers a place to rest and look down at the creek. The wide, hard-packed trail continues up the rim of the canyon with two more viewpoints perched on the edge of the canyon wall and hemmed in by chainlink fence. The view of the creek, as it meanders through the steep-walled canyon forming various ripples and small waterfalls, is fantastic. Gradually the trail levels out and then begins a descent to the creek. A pit toilet is located here. The trail follows the creek for a short distance before crossing to the south side. The canyon forms a microclimate with noticeably different vegetation on the two sides of the creek. The slope on the north is dry with Ponderosa pine and bunches of grass while the cooler south side has Douglas fir and carpets of moss, evidence of more moisture and shade. Allow 1 hour to hike Canyon and for your own safety and preservation of the park, obey posted signs and keep to designated trails. Shortcutting trails destroys plant life and soil structure. The Canyon Trail was affected by a wildfire in 2011. Wildfires have produced many hazards in the area. You should be aware of these hazards and the increased risk of injury prior to entering the area. The hazards include: unstable trees, holes and loose rock. The hazards have been reduced along the main trail system and campground areas. Travel off the main trail system has an increased level of risk. Pets/domestic animals must be on a leash at all times and are not allowed in beach areas or buildings. You are responsible for their behaviour and must dispose of their excrement. Backcountry areas are not suitable for dogs or other pets due to wildlife issues and the potential for problems with bears. Over 400 metres of coarse sandy beach stretches the length of the campground from the day-use area to the creek. There are pebbles on the beach but no big rocks in the water. The beach is narrow and the swim area is marked with buoys. There are NO LIFEGUARDS on duty at provincial parks. Okanagan Lake provides many waterskiing and jetskiing opportunities. Jetski and boat rentals are available at Lake Okanagan Resort ten minutes north of the park on Westside Road. Excellent views of the canyon and lake from the canyon trail. The cottonwoods along the creek and the delta provide habitat for a variety of birds and offer birdwatching opportunities. Cold water is available for cooking and drinking and taps are located throughout the campground; from well water. Bear Creek offers 21 reservable vehicle accessible campsites with electrical hookups. Sites 123-129, 131, 133, 136, 140, 142-143 offer 30 amp service and sites 130, 132, 134-135, 137, 139, and 142 are pull-thru, paved sites that offer 50 amp service and water. Each site has its own picnic table and fire ring. There is an additional electrical service charge of $8.00/night for the sites that offer 30 amp power and $10/night for sites that offer 50 amp power and water (whether the power is in use or not). Upon entering the campground, turn left to access the day-use/picnic area with some 12 tables and parking for 80 vehicles. The tables are spread out on lawns overlooking the beach and shaded by well spaced mature cottonwood and oak trees. The tables have a great view across the lake to the city of Kelowna and Knox Mountain. Right next to the parking lot is bathroom/change house with flush toilets that are wheelchair accessible. A kiosk beside the changehouse has interpretive signs discussing the area and some of the issues facing the park. The large, open lawns found throughout the park offer opportunities for a variety of activities. Flush and pit toilets are located conveniently throughout the campground. There is a washroom building found at the park entrance just past the gatehouse with the men’s and women’s sides each having one regular and one wheelchair accessible shower stall. Two more flush toilet buildings are found next to sites 26 and 54. These also have shower stalls, one each for the men and women with access from the back of the building. The southern campsite loop has a washroom building with flush toilets and three shower stalls each for the men’s and women’s sides. There are also two pit toilets across Westside Road - one at the trailhead and another in the middle of the trail loop. Bear Creek Provincial Park has a playground equipped with two separate structures. The facility has many features designed for two separate age groups. The first structure is designed for children ages from 2 to age 6 with activities that we are sure your children will enjoy. The second structure is designed for the more adventurous children ages from 8 to 12. The facility is located in the grassy area beside campsite 30/31. There is plenty of room for parents to sit on the grassed area and be spectators or to engage with their children in the playground. During the collecting season a sani-station/dump is available and a fee is charged for the service. The sani-station/dump is located across Westside road from the gatehouse next to the Canyon Trail parking area. There are hot showers in the washrooms. There is no extra charge for showers and they are for registered guests only. The park has one campground, though it is divided by Lambly (Bear) Creek. There are 143 vehicle accessible sites in the park, including 18 doubles. All campsites require reservations at this park. Sites are # 1-80 on the north side of the creek in two loops. These medium to large sized sites are found amongst well spaced trees and irrigated lawns. The trees are well trimmed and a mix of both coniferous and deciduous with many non-native species present. The effect is of fairly open, well manicured grounds. The sites are gravel and have a fire ring and picnic table on a cement pad. There are no BBQ table attachments. Nine of these sites back onto the creek and are slightly smaller and surrounded by more dense vegetation. Crossing the creek within the campground leads to sites 81-122 on the south side of the creek. This area of the park is newly landscaped (sites were developed in 1996) and though most of the area is now shaded, some of this area is still open with newly planted saplings, irrigated lawn and raised beds of bark mulch landscaped with low growing plants and bushes between the sites. This area has its own shower/washroom building and taps. Newly developed Sites 123 – 143 are on the north side of the two loops. 14 of these sites offer 30 amp power and 7 of these sites are pull-thru�s and offer 50 amp power and water. The pull-thru sites are paved and do not allow tents.The other 14 sites are gravel. All of these sites have a fire ring and a picnic table. The area was landscaped and irrigated in the Fall of 2018. A gatehouse is situated near the park entrance just off Westside Road with a payphone and an information shelter. There is a gate on Westside Road which is locked from 11:00pm to 7:00am during the operating season and then locked during the off-season. 30 amp Vehicle Accessible Camping Fee:$35.00/party/night camping fee plus $8.00 electrical/night = $43.00/party/night. 50 amp Vehicle Accessible Camping Fee:$35.00/party/night camping fee plus $10.00 electrical/night = $45.00/party/night. BC Seniors' Rate (Day after Labour Day to June 14 only) $16.00/senior party/night plus $10.00 50 amp electrical/night = $26.00/party/night. Wheelchair accessible; the park is mostly level, with paved and gravel roads. Showers and toilets have handicapped access.